There is a new liqueur on the block and looking to make a name for itself in the watering holes of America. Redcliff claims to be America’s “first premium liqueur”, and since it is predominately cola based, with a touch of vanilla and about 15 secret spices, that is not an unreasonable claim. 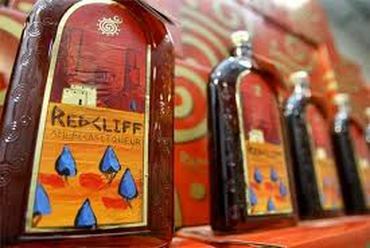 Redcliff joins such other national treasures like Baileys Irish Cream (Ireland), Amaretto, Limoncello (Italy), Kahlua (Mexico) and Pimms (England) as the flagship liqueur of a country. It is 65 proof (32.5% Alc/Vol) and is particularly potent when served with equal parts of rum, bourbon, coffee liqueur, amaretto and flavored vodkas. 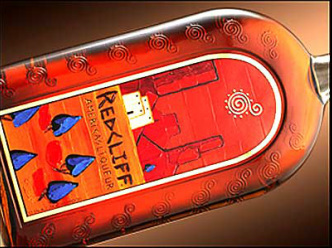 Coming in an attractive 750ml bottle (with other sizes to follow), that is shaped like an elliptically shaped cowboy saddlebag flask with petroglyph glass embossing with a southwestern style label by Colorado artist Stephen Reaves, Redcliff is the brainchild of former Seagram’s executive Franklin J.Arcella. He is known in the liquor industry for the creation of Corazon Tequila, and for establishing a successful Davidoff luxury cigar operation. He spent just over two years perfecting the taste along with flavor chemist Dr. Win Adler, and the finished product combines 15 diverse ingredients with a pretty distinctive and highly complex aroma. Redcliff is currently available in ten major markets at this time, but is expected to be distributed nationally in time for December 2006, a perfect time of year for this festive drink. Marketing plans not surprisingly have been drawn up to target college kids, the military, sports bars, country and western fans and the NASCAR crowd. The complex and rich tasting liqueur can be served straight, chilled or on the rocks, with any kind of juice, Red Bull or Club Soda, and with any combination/percentage you choose. I tried it with a Kiwi juice and ice in parts 5 to 1 for juice, and found it a refreshing combination with just the right kind of punch. Mixologists will love Redcliff, although individuals trying it for the first time should sip a small amount in a glass by itself to get familiar with the spices, and then move on to whatever combination of spirits/juices to add. Signature cocktails are likely to become familiar names in the not too distant future starting with Double Red Slammer (w/ Red Bull), Jagged Cliff (w/ Jagermeister), Kona Cliff (w/ coffee liqueur), and Doctor Cliff (w/ cherry flavored schnapps). The Redcliff Martini comes with citrus vodka, and the Redcliff All American comes all the way with whiskey bourbon.